Combining Latin horns, showtime music, and samples of scratches from ’80s and ’90s rap are things that not even the most diverse artists risk doing, but indie hip hop fusion duo Zion I make it work in tracks like “Get Yours” from their second of three free EP’s, entitled Libations, which was premiered by URB. Promoting unity and upliftment, the duo unveil this project as a means to change the perception of hip hop by simultaneously infusing elements of spirituality and a mix of genres including trip hop, R&B and a bit of Latin flavor. With entrancing melodies and soul-infused synths in tracks like “Last Night” that are leaning more towards the R&B side, and the medieval-regal sounding intro for “Lateef’s Song,” every track has a different flow and vibe. The EP is a taste of the group’s visual and experimental aesthetic. 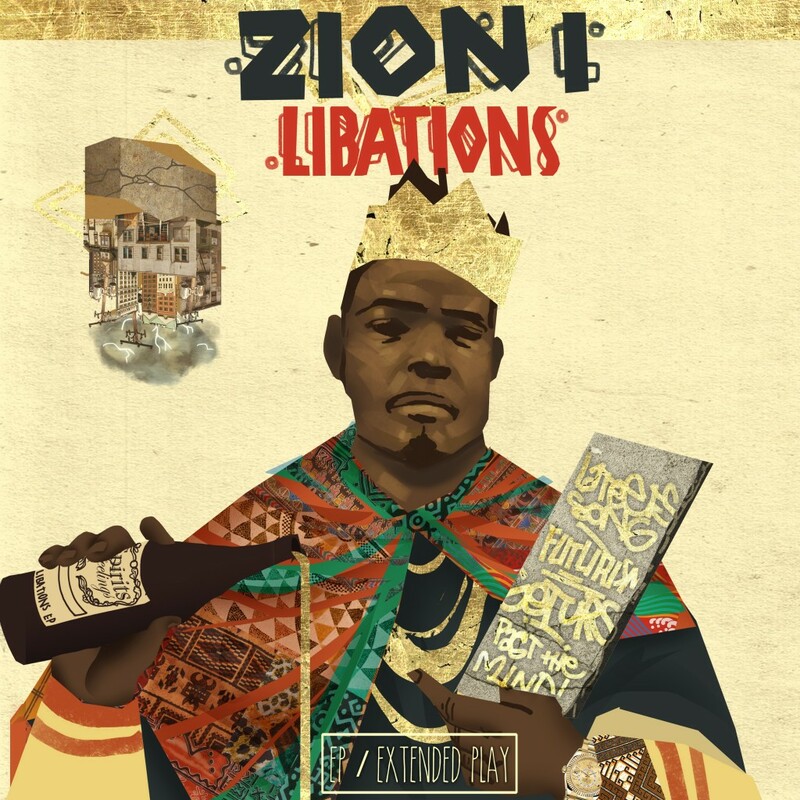 Composed of rapper MC Zumbi and producer AMP Live, Libations holds as part two of their free EP trilogy. The duo previously released part one of the album, an EP entitled Master of Ceremonies. In creating the first part, MC Zumbi says, “We took it back to ground zero in creating these songs. The sole purpose of the emcee is to energize, invigorate and guide the listener to a higher state of mind, whether that be reflection, relaxation or enlightenment.” Switching gears, the duo explains that Libations is completely different. Zumbi explains, “This project was heavily influenced by one of my best friends passing away suddenly. His death put me in a mood to really analyze my life and how short this existence really can be. It opened my eyes and heart to both the ugliness and beauty of what we experience while alive.” Hence, Libations broods with reflection and deep emotion. “To me, libation is when you honor someone by pouring out your brew before you sip, its a sort of prayer. On this EP, I poured out some liquor for my homie, as well as my family, and myself.” Aside from production by AMP Live, the EP also features production from Headnodic, and newcomer Featherload, as well as features with rappers Mr Lif, Sadat X, and Opio from Souls of Mischief. Founded in 2006, Ineffable Music is a boutique management firm and record label with a roster featuring the likes of Hieroglyphics Imperium, Zion I, Pep Love, Collie Buddz, Los Rakas, Stick Figure, CunninLynguists, Amp Live, Crush Effect, Nima Fadavi, A1, Vokab company, and Wheeland Brothers. With a focus on cultivating the live experience through proper touring and effective branding, Ineffable Music has established a reputation for having an effective and no-nonsense approach to the business. On the creative side, “We are fans first and foremost” explains co-founder Thomas Cussins “but, we select who we work with based on personality and character just as much as music.” The word “ineffable” is defined as: too great or intense to be expressed in words and propels the motto of striving for uncompromising quality.